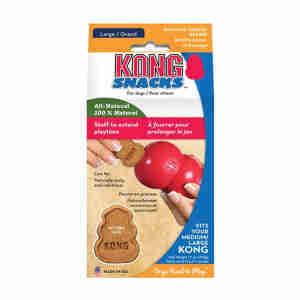 Kong Snacks are delicious dog biscuits specially designed to fit into the Kong Classic toy. The specially shaped Kong dog biscuits fit in the Kong Classic toy and extend the joy of playing with the Kong. The shape prevents easy falling out, so that her dog has to make an effort. Only after extensive rolling about the snack eventually falls out. Even without Kong, the biscuits are ideal for games and training, because they taste so deliciously irreplaceable. Click here to find the cassic Kong toy. Cereals, meat and animal by-products (1% dried pieces of ham), oils and fats, milk and dairy products (1% cheese powder). Depending on the activity and age of the dog: 2-6 snacks per day. If necessary, reduce the quantity of main food accordingly.